The way your weight is distributed between your skis determines how much each ski will influence your movement. As with longitudinal weight distribution, the point at which your weight is over will want to fall down the slope. 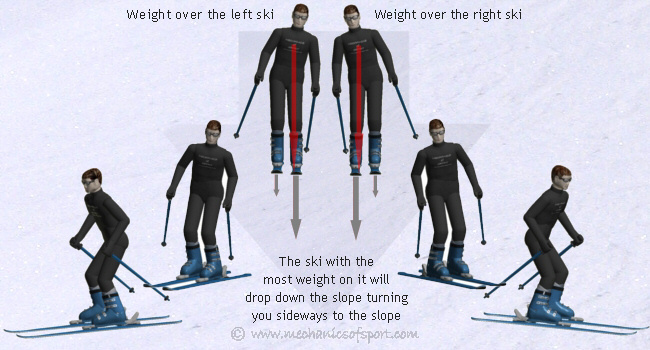 Whereas longitudinal weight distribution turns you into the fall line, as you make either the front or the back of the skis fall first, lateral weight distribution, brings you out of the fall line to having your skis sideways to the slope, as it is one of the skis that wants to fall down the slope first. The more weight is put over a ski, the quicker you will reach the sideways position as well. This is all assuming that your weight is in the middle of the ski lengthways, otherwise longitudinal weight distribution will be coming into play as well. The ski with the most weight on it will also control your movement more than the other, as it is being pushed into the snow more, and has more grip. The proportion of your weight on that ski will determine how much more influence the ski will have, this comes into play more when you are in the snowplough position. To make a turn we are basically trying to make it so that the uphill ski, becomes the downhill ski. Whichever ski has the most weight on it will want to fall down the slope first, as you are effectively pushing the ski down the slope. The reason the downhill ski would have been the downhill ski, is because there will have been more weight on it making it fall down the slope ahead of the other ski. So in its simplest form, making a turn is just putting your weight over the uphill ski, so that it falls down the slope and becomes the downhill ski. It is important to realise this, as it is the basis of turning. Coming across a slope and making a turn to go the other way, is basically just changing the ski that is further down the slope. When we turn though, longitudinal weight distribution is used to start the turn off, as the lateral weight change has a larger effect once you are pointing more down the slope and will bring you round the turn more quickly. The distribution of your weight between your skis also determines the angle at which you will come across a slope. Obviously if you have your weight evenly between the skis they will both want to fall down the slope the same, making the skis level and you travel straight down the fall line. If you have all your weight on one ski, that ski will come all the way in front of the other ski, so that it is sideways to the slope. Any weight distribution between the 2 extremes though, will end up with you pointing across the slope at an angle, being a steeper angle if the weight is more evenly distributed, and a shallower angle if there is considerably more weight on one ski. This is assuming that your weight is in the middle of the ski lengthways, or longitudinal weight distribution will also have an effect. 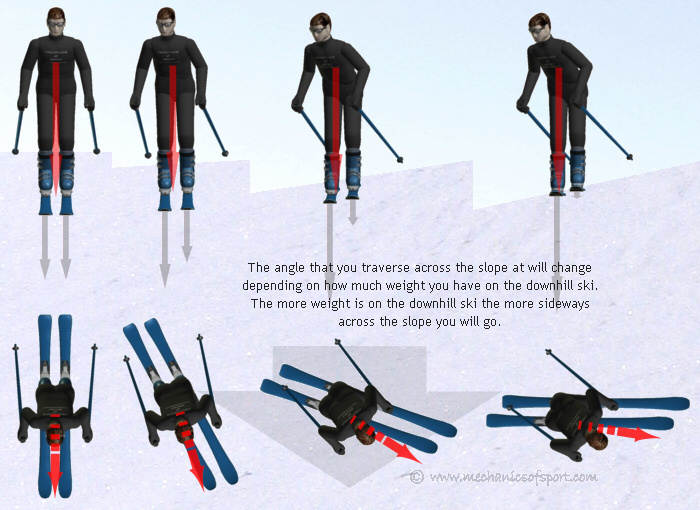 The diagram below shows how the weight distribution between your skis can change your angle across the slope. Generally your weight should always be put on the outside ski in a turn, or the downhill ski as you go across the slope. There are a couple of reasons for this, firstly the ski with more weight on it will naturally want to fall down the slope first, making it the outside ski in a turn, or the downhill ski if you are coming across the slope. Secondly if you loose control of the outside/downhill ski, the inside ski can be used to recover. If the weight is on the inside ski, and you loose control of it, the outside ski will generally jump into the air and will not be able to help you recover at all. There is a situation though where both lateral and longitudinal weight distribution do not work as described. If the edges of the skis are dug into the snow too much they will have too much resistance and will not let the skis slide sideways, stopping weight distribution having the same effects. For both longitudinal and lateral weight distribution to work as explained, the skis need to be able to slide sideways, so that they can turn. The edges are used like this when carving, but that uses different rules to make turns. On to the Stance section.